On February 23, the students in grades five through eight participated in Gym Riot. Gym riot gives students the opportunity to experience a variety of weird and wacky competitions which focus on cooperation amongst team members. Congratulations to the winning team. It takes cooperation and a healthy dose of competitiveness to come out victorious! The Winter Carnival for the kindergarten to grade 4 students was rescheduled due to February’s chilly temperatures. The new date for the Winter Carnival was March 9 and the weather was absolutely fantastic! A good time was had by all; a special thank you to the parent council for providing the delicious hot chocolate and to the junior high students who volunteered their time to help the younger students. March means the end of our basketball season. Congratulations to the students who participated on the basketball teams. Boys and girls in grades six through eight had the opportunity to learn and experience basketball in the competitive setting of extra-curricular sports. A special thank you to Mrs. Toulman and Ms. Hallson for coaching the girls’ team, to the students who served as scorekeepers, and to all the parents who volunteered their time offering rides to and from games. 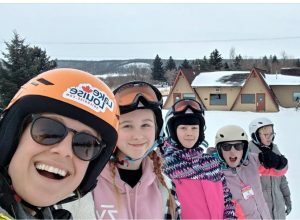 On March 8th the junior highs travelled by bus to Holiday Mountain and had the opportunity to participate in an amazing outdoor winter activity; downhill skiing! It was enjoyed by all who took part. In the gym, March includes our ultimate football unit, relays, a unit of low organized games working on motor skill development, fitness testing, and a chance to explore the climbing apparatus and other choice activities. I don’t know about you but I am definitely looking forward to spring!